Comments: Shown here is a Burgess panorama and the earliest photo in this collection. The James River Valley Fair grounds were located just west of Scottsville along the James River bottomland near the present Uniroyal Plant. First launched in 1883, the James River Valley Fair ran three days of horse racing with purses, jockey colors, and three judges per race. During the heyday of its racing, Scottsville knew excitement, noise, crowds, jostling and betting. And as thorough- breds thundered towards the finish line, wild cheering ensued. The Fair also included games, music, agricultural exhibits, and speechmaking which soon became an annual event attracting hundreds of visitors to Scottsille. It is not known when or why these fair grounds were abandoned, but we believe this photo was taken towards the end of its useful life. Since the fair grounds were built on bottomland that frequently flooded, perhaps it was finally washed out by one of the frequent James River floods. 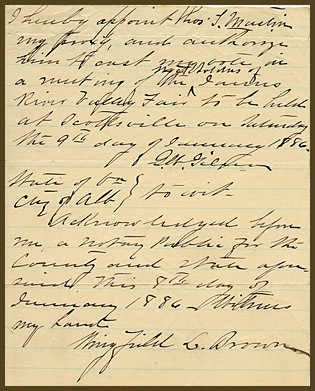 Shown at right is an 1886 notarized document where G.W. Gilmer, a Scottsville citizen and stock holder in the James River Valley Fair, transfers his vote to his proxy, Senator Thomas S. Martin of Scottsville. A newspaper article that demonstrates the excitement in town during the James River Valley Fair was included in the Midland Virginian, August 30, 1888: "This, the sixth annual meeting of the above Fair takes place on the 19th, 20th, and 21st of September, and those who intend exhibiting should begin making preparations." "The attractions put forward this year are more numerous than ever before, and no stall fees are to be charged on any animal for exhibition except when they are awarded premiums." "A new feature of this fair is the addition of athletic sports under the management of a committee of which the Hon. Pembroke Petit is the chairman and from whom particulars may be had. The sports are to include flat racing, jumping-sack racing, a potatoe race, ball throwing, a three legged race, and a tug of war between the four counties - two and two - Fluvanna, Albemarle, Buckingham, and Nelson. The first named to pull against each other on the first day, the two last named on the second, and conquerors on the third day when the winner will secure the premium." "A novel feature is a display of horsemanship by ladies; the gentlemen on the grand stand are to be the judges. The ladies are to have handsome colored sashes presented to them. They are to manage their horses as they please, and the one receiving the largest number of votes secures the premium, a twenty dollar gold piece or a handsome side-saddle. This will prove an immense attraction on the first day." "An unusual number of fine race horses are expected. There will also be an extra special attraction of which later notice will be given, and the public speakers are to be some of the best known in the state, among them Col. O'Ferrall, St. George Tucker, Maj. W.A. Anderson and others. The admission to the Fair only costs twenty-five cents."